May 23 was a day before the day event. SPC had a day 2 moderate for the 24th and with the 13z update, upgraded the 23rd to MDT as well. We concluded the chase yesterday in Tulsa, A trough digging in from the west was expected to amplify as upper energy moved onshore west of Baja, this was going to be the focus for the outbreak on the 24th/25th. However, another day of strong heating coupled with a diffuse boundary draped across the OK/KS border and some relatively strong LLJ expected later, we figured there would be action in west central Oklahoma, so we left Wichita shortly after lunch and made our way through OKC and westward on I-40. 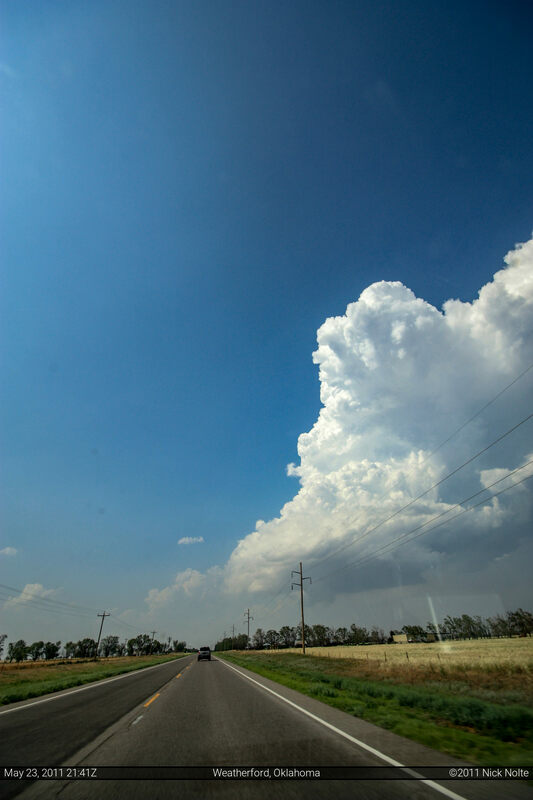 Shortly after 20Z, towers starting going up just southwest of Clinton, so we headed down to check it out. 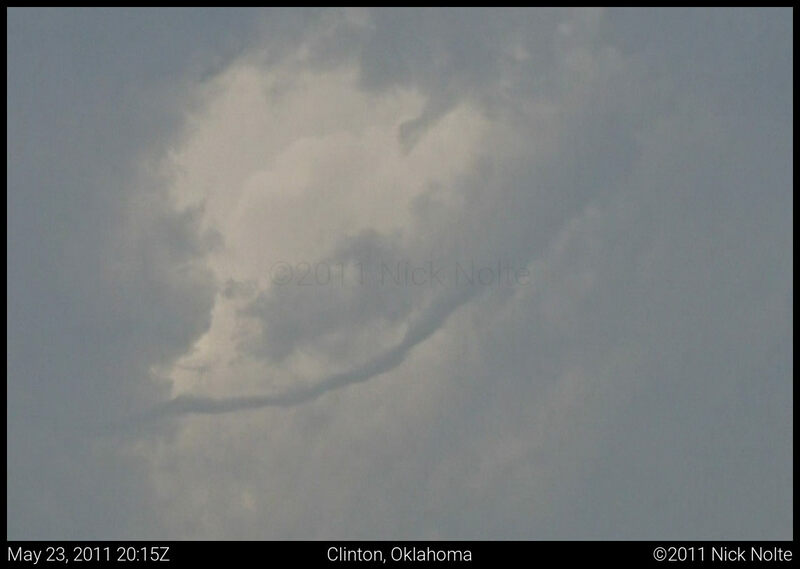 It was here where we spotted a shear funnel midway up the cloud deck. Nothing screaming tornado, but I hadn’t seen anything like it before, so it was a cool sight. 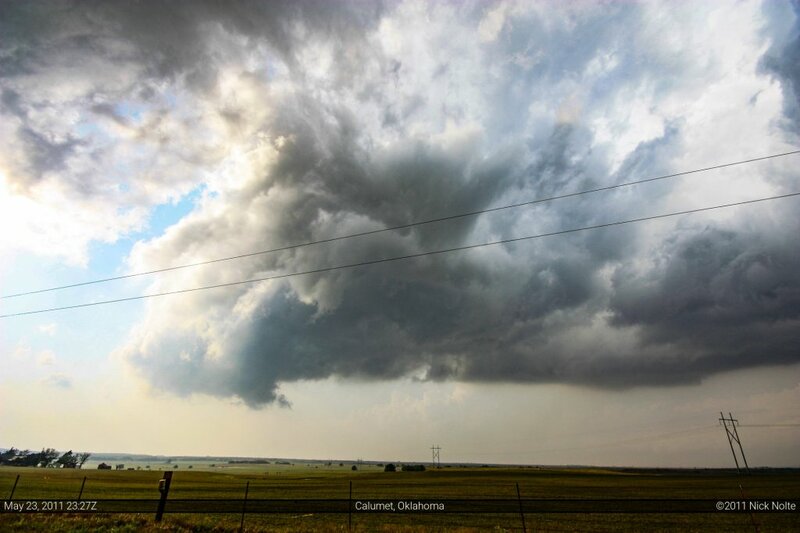 The storms that were trying to go up just weren’t getting going and we headed south to Cordell to give them more time. The storms that had gone up were just not holding together, probably a mixture of some slight cap remaining along with a lack of forcing mechanism. 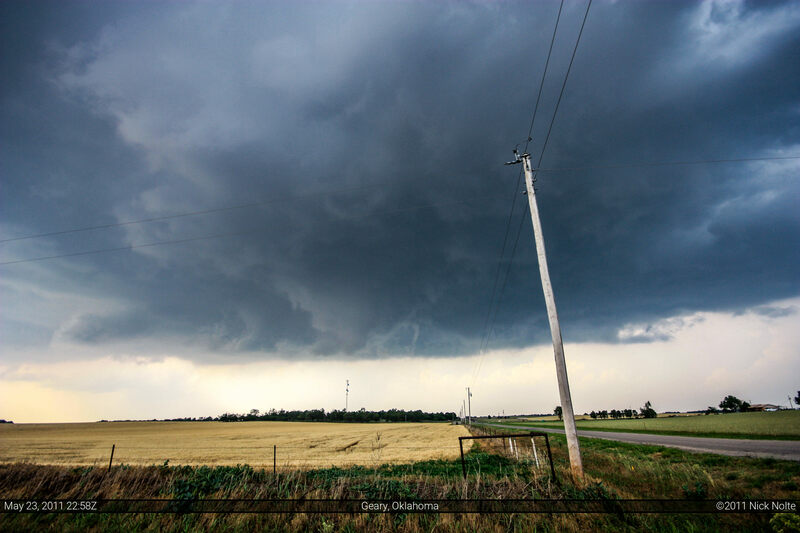 So, we sat in Cordell while a line of disorganized, weak storms passed over without much fanfare. 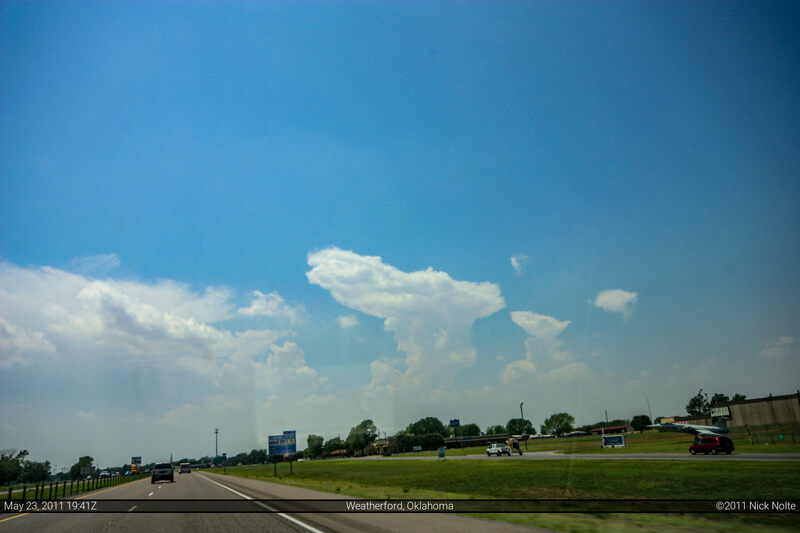 Shortly after 21z we noticed a Cumulus field to our north that was looking a bit better on visible satellite, so we departed Cordell and went back east on I-40 to Weatherford then north on highway 54 towards Thomas. On the way we got a good look at the billowing Cb as things were finally getting organized. 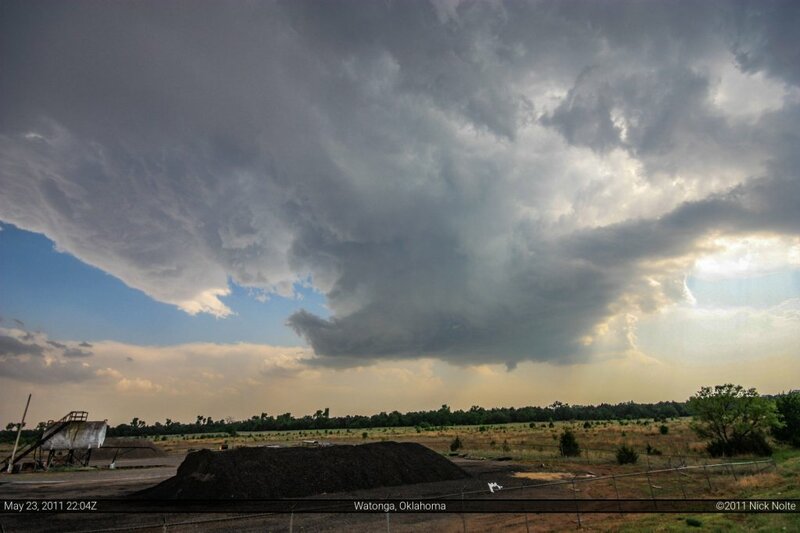 We stopped just west of Watonga to check out the storms we finally caught up to. 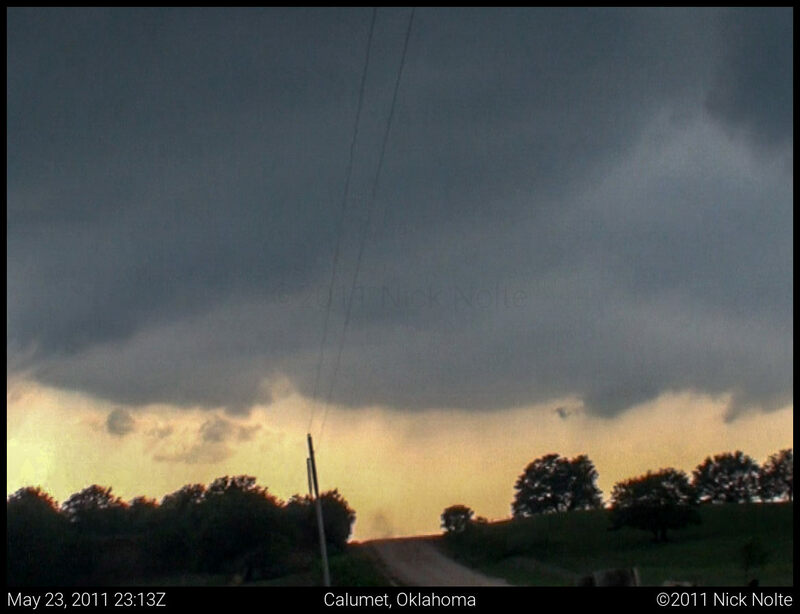 The one to our south was trying to get a decent looking wall cloud going, but nothing terribly exciting yet. We stopped in Watonga for a rest and some pea size hail was had as a storm passed over town. We followed it to the southeast as it plodded along at a leisurely pace, noting that it was still trying to get organized. We sat here at the intersection of 234th St NW and Maberry Rd monitoring the storms progress as it inched closer. 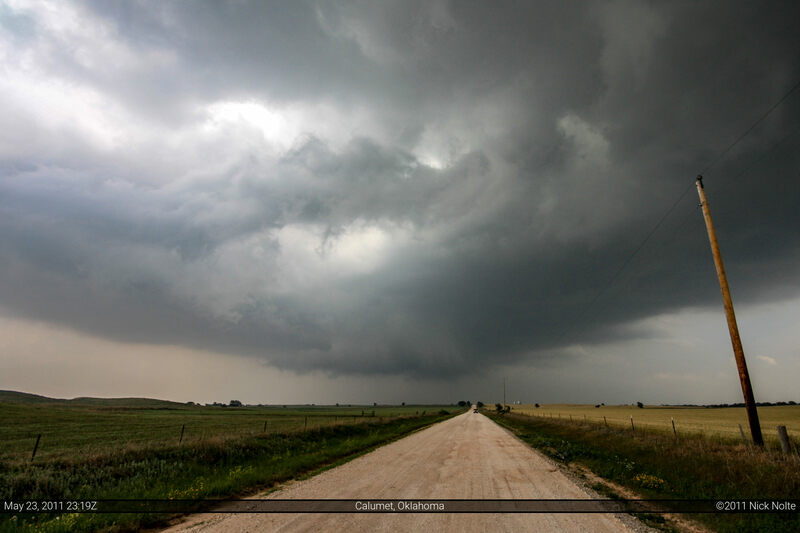 Then we witnessed a quick spinup on the dirt road to our west and then decently rapid rotation right above us, so we bailed east as we figured we were close to, if not right under, the meso. 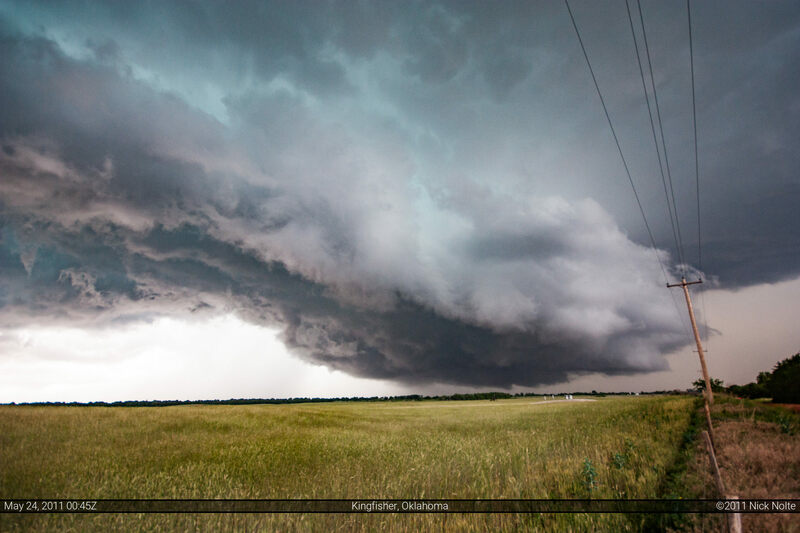 We eventually bailed on the storm and turned north on US 81 towards Kingfisher where the dominant storm was cranking up. 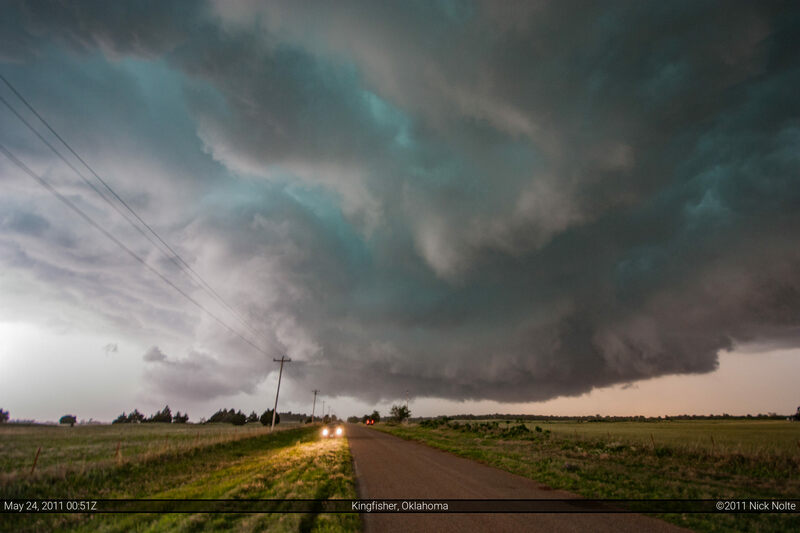 We stopped to check it out just west of Kingfisher and it was looking rather ominous. We kept up with it for a little bit, but it eventually went outflow dominant and evolved into a bow echo with a decent shelf cloud shortly after dusk. We stopped in OKC for some dinner the bolted back to Wichita to get in position for the 24th.